If you serve immigrant customers, you should be selling top-ups. If your customers come from all over the world, then they are always on the lookout for ways to support their friends and family back home. One of the best ways? Topping up the mobile phones of their loved ones back home… from your store! It’s easy, instant, affordable, and so convenient. Millions of immigrants purchase international mobile top-ups weekly. That’s value for them, and repeat foot traffic for you! Whether you are already selling top-ups or are just getting started, Prepay Nation can help you. We provide the inventory, the sales system, the marketing materials, and the deals. Just add customers! Tell me more about top-ups! If you’re new to the business of selling either domestic or international mobile airtime, we can help. Download our free introduction to the wide—and profitable—world of mobile top-ups! You’ll learn everything you need to know to hit the ground running. How can this work better for me? So you already sell airtime, but you aren’t seeing out-of-this-world success. 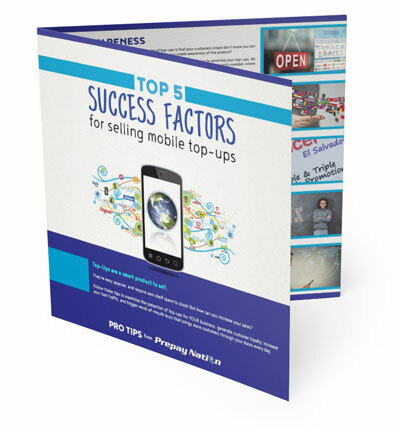 Here are the top five factors that influence your success selling top-ups. Use our free, downloadable Tips to find out what could make all the difference in your airtime sales program. If you’re ready to talk details with one of Prepay Nation’s best partner setup managers, good news: You can do that by filling out a few basic details. This helps us get you to the right specialist, who will get in touch right away.